A more in-depth look about how the Burgundians care for their land and some extreme methods of Mdm Leroy. My guide for today was another affable man named Lulu from Wine & Voyagers. Lulu is born in Burgundy as well and used to be a sommelier. Lulu explained to me that the forest played its role here in Burgundy. Because of level of rain here each year, copper sulphate is sprayed in July and August which gives the leaves a shade of yellow to it. Spotting some vines covered with a white bag, I asked Lulu about them. 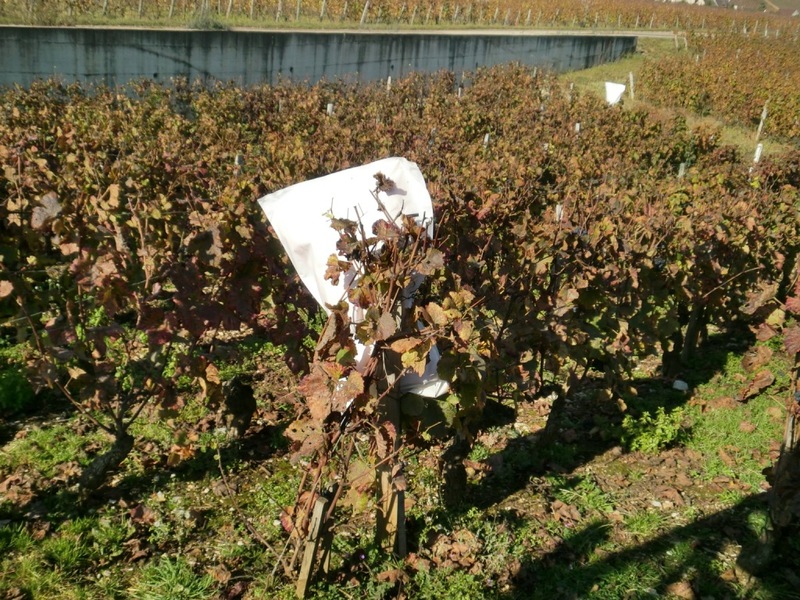 I learned that the white bags were used as indicate to the helicopters which vineyards were for spraying. The helicopters would hover closely above each vine to perform the spraying. Lulu added that he once had a client who was a helicopter pilot and that the client was amazed at the skill of the Burgundian pilots. “We never had any accidents here so far,” boasted Lulu. Lulu spoke more about vineyard practices. During the winter, temperatures can drop to -10 to -15 degree celsius. It is possible to have snow 2 to 3 times a year during the winter. If temperatures were to drop to -20 degrees celsius, this could potentially kill the vine. 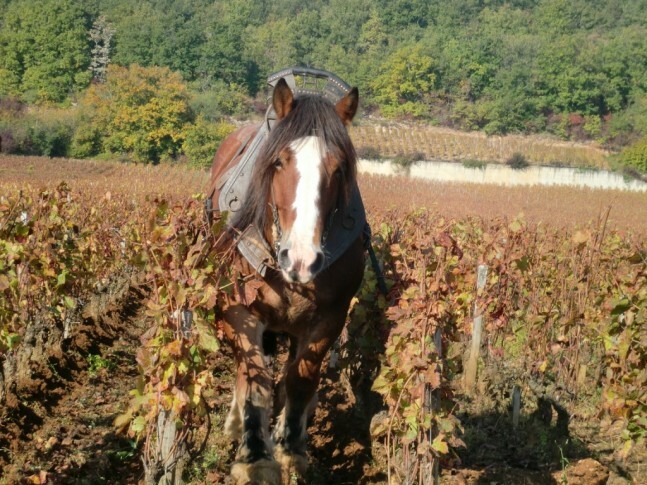 Thus, ploughing (buttage in French) is an important vineyard practice carried out before the onset of winter. The soil is unearthed and the trunk of the vine is buried in earth. This keeps any cold air out of the vines and the earth acts a blanket around the vines. The ploughing is rather low and can range from 1 up to 10 cm. This also explains why the vines are planted so low to the ground. There is also another sort of ploughing which is also done on the centre of each vine row. The purpose of aerating the soil is to let oxygen into the soil to allow micro-organisms to breath, contributing to the soil health. At the same time, micro holes in the ground are created to allow rain and fallen leaves to seep into the soil and give energy and nutrients back to the earth. The canes which have been pruned (called sarmont in French) are crushed and put back into the soil. Unless there is disease in the vines, they are burned instead. Sometimes, fertilisers are added in the process. Ploughing also releases water from the soil so that vine roots will not stick to the surface to search for water. This is done only when the soil is dry. When the ground is wet and the land is ploughed, the water released will increase the humidity in the vineyard and cause diseases. This can be observed when after ploughing, green leaves become darker in its colour. Each year, ploughing is done at least two times. One is before the spring frost and the other is usually in April and May, after the spring when the grass comes up. Some growers would plough to get rid of the weeds and grass as some wine growers do not use weed killers. There are times when water stress may be too high and this is desired. For others, they prefer to leave the weeds alone as it adds to water stress on the vines and encourages the vines to root deeper down the soil. Another method to encourage deeper root growth is a method called griffage, which is a sort of cutter that digs deep into the soil, sometimes up to 20 cm, to cut the roots that are growing horizontally to encourage deeper rooting. Tractors with low pressure wheels are used to do this job so as not to compact the soil. These tractors are customised and are usually expensive. Therefore, some growers would use a horse or even do it by hand. Some vineyards still have roses as it is said to be used as a marker for horses when they are turning into the next row of vines. Honestly, I am not sure how that works because I thought horses couldn’t see red. In Burgundy, rabbits pose some problems to the vines especially newly-grafted vines. Rabbit guards are often needed to protect these vines from them. According to Lulu, the birds here are not as aggressive as Australia. Also, the vines are planted so low that it is hard for the birds to pick off any grapes. Lulu also explained more to us what the French called as verjuice. Verjuice is the second or even third generation of grapes that are produced near the top of each shoots every year. During the harvest time, only the first generation grapes are picked, which are close to the ground and near the trunk. They are usually below the first wire. 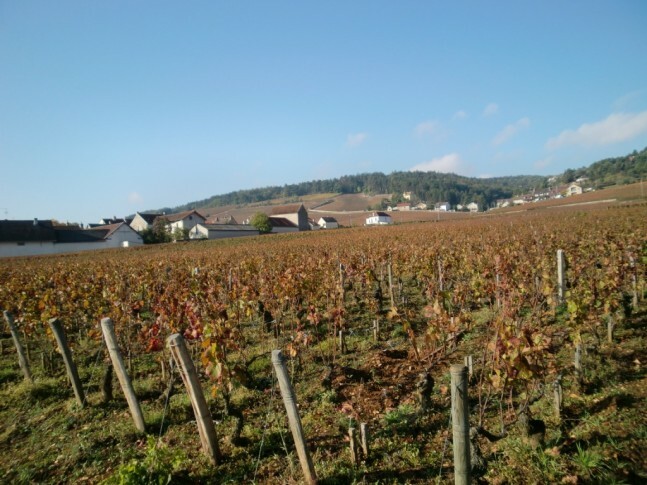 At this time, the verjuice are green and are not harvested as it imparts unripe and acidic flavours. Sometimes, they are harvested if the winemaker decides that he wants to prop up the acid of the grape must. 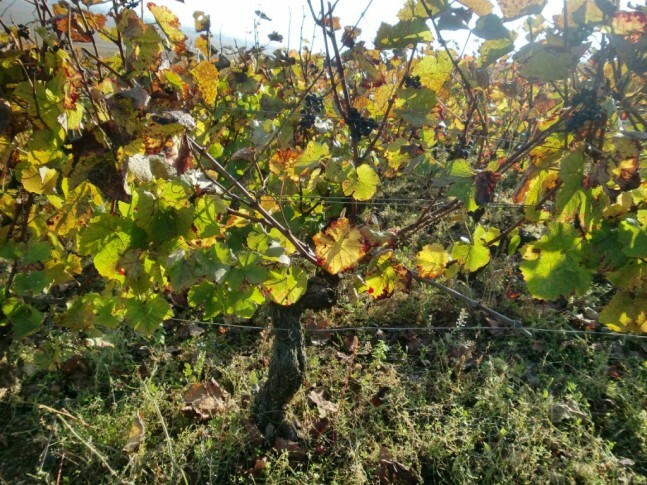 It is later in November that the verjuice starts to ripen but by then, the harvest is over so they get left on the vines. 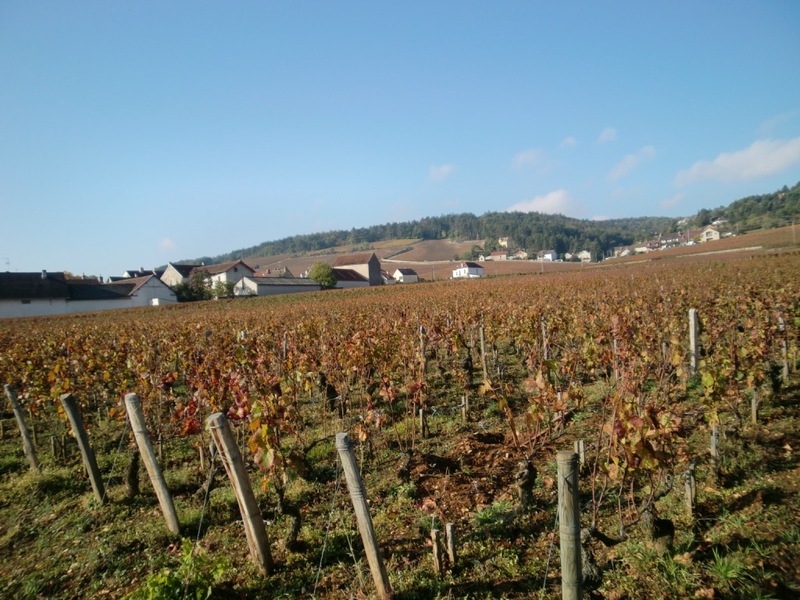 As we drove by the vineyards of Richebourg, Lulu pointed out to us the vineyards of Domaine Leroy. 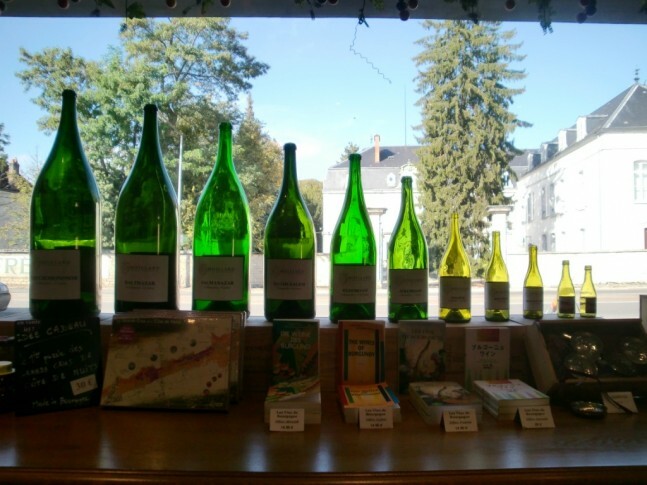 “There are noverjuice from Mdm Leroy’s vineyards. She ties down her canes every year to prevent verjuice. That is why her grapes are so concentrated,” said Lulu. This sounded crazy to me as I could not imagine a vine that did not have any second generation grapes. The purpose of tying down canes was to delay budding of the shoots. This is a method used throughout the world and also on other grapes such as Nebbiolo to counter apical dominance. I found Leroy’s method very extreme as this meant tying down the 3 to 4 canes which produced fruit to the wire to slow down the growth of second generation fruit. It was extreme viticulture and a lot of extra effort was needed. Yet, the idea was so simple. Without the second generation fruit, more energy can be put into flavour development of the first generation fruit. Lulu brought us to Chateau Ziltiner which was a hotel and a wine producer. The 2009s were very dark-coloured and concentrated. According to Lulu, it was a hot year and the hotter a year is, the thicker the grape skins are which imparts more colour and the grapes contain less juice. I was once told by a Swiss winemaker that a hotter weather gives thicker grape skins which is why Pinot Noir in Central Otago is much darker due to more UV rays. It makes sense as it is a sort of natural adaption that grapes gain in a thicker skin in an environment with stronger sun. Yet, research has also shown that a strong sun can cause discolouration in berries. Lulu also believes that the tinier the berries, the most flavours they contain. These tiny clusters can come about from tiny vines which are that of Burgundy. Indeed, wine will always be a mystery to me. Medium purple colour. Light cedar nose with heavy pinot notes, a light spice and cinnamon. Tastes a little like an Australian Mornington Pinot. Extracted and black tea. Flavours of light plums in the back palate. Med alcohol, med+ acid, med length, med tannins. An acceptable Bourgogne for the price. Almost transparent ruby colour. Cedar with aromas of shaven wood, lacquered woody notes, a medium intensity. On the palate, a long length but the mid-palate needs more weight. High acid and light prunes. Finishes lightly in the back. Med purple colour. Leather, plums and lifted strawberries with redcurrants and cigarettes. Closed on the palate with a short length. Dominant acid. Semi-opaque purple. Med intensity, blackcurrants and light cloves. High acidity with med (+) tannins, balanced and long length. Lovely wine. With a good fruit and oak balance. Semi-opaque purple. Notes of spice, licorice and white out. Med intensity. On the palate, god acid and a very long length. Light leather and bramble fruit. Elegant and balanced. 25% in 2 year old cask. Next in the series, Meursault!